An increasing awareness of environmental and energy issues and evertighter building regulations all mean that the operating environment in industrial construction is changing. Using state-of-the art composite panels helps you rise to the challenges of economic construction and modern design needs. Great demands are also placed on the associated fasteners. SFS offers the answer with the SXC family. These parts fulfil a host of requirements in terms of both installation and long-term behaviour. SFS SXC self drilling fasteners have been specially developed for composite panel systems. Dynamic stress caused by temperature changes, foot traffic or wind load simply won’t affect fastener performance. The supporting top thread, thread-free zone and the vital sealing washer ensure a lifetime seal. To meet the requirements of architectural aesthetics, SFS offers these fasteners in any colour. The tried and trusted sela heads accurately matches the exact colour of the composite panels being used. 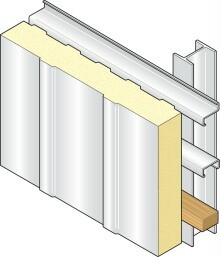 The front attachment enables simple and easy installation of the composite panel fastener. This is particularly useful where extremely long fasteners are required. The depth locator also inhibits dimpling of the sheet, as well as water ingress.